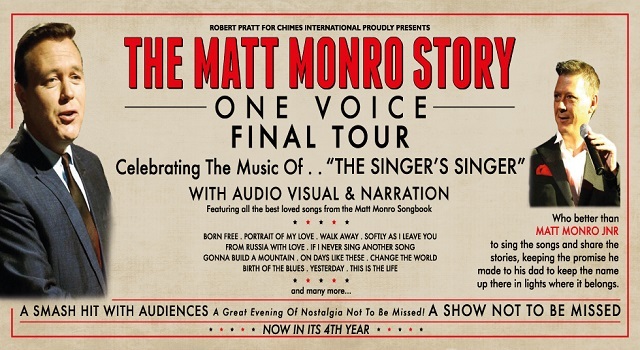 The Matt Monro story is an inspired and unforgettable show. CELEBRATING THE LIFE AND MUSIC OF THE LEGENDARY MATT MONRO. THE MATT MONRO STORY IS AN INSPIRED AND UNFORGETTABLE SHOW. A UNIQUE EVENING OF MUSIC, WARMTH AND LOVE, KEEPING THE MEMORY OF HIS MUSIC ALIVE. FROM ‘BORN FREE’ TO ‘WALK AWAY’ TO ‘POTRAIT OF MY LOVE’ BE PREPARED TO BE TRANSPORTED IN TIME BY THIS TRIBUTE TO ONE OF BRITAIN’S MOST POPULAR AND ENDEARING SINGERS NAMED “THE SINGER’S SINGER” BY HIS PEERS.